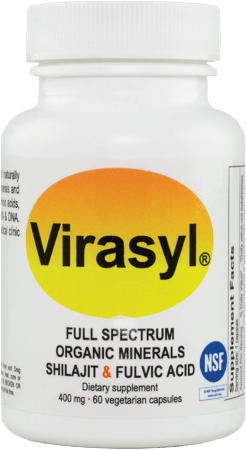 Ingredients in Virasyl® are scientifically validated through over 10 years of university and clinical research at the following institutions: Banaras University, India; Central University, Cuba; Mercer University School of Pharmacy; Texas A&M University; University of Wisconsin; North Carolina University; and Virginia Scientific Research Inc.
Vaskova J et al. Effects of humic acids in vitro. In Vitro Cellular & Developmental Biology – Animal. June 2011, Volume 47, Issue 5-6, pp 376-382. Schepetkin IA, et al. Complement fixing activity of fulvic acid from shilajit and other natural sources. Phytotherapy Res. 2009 March;23(3): 373-384. Beer AM, Lukanov J, Sagorchev P. The influence of fulvic and ulmic acids from peat on the spontaneous contractile activity of smooth muscle. Phytomedicine 2000 Vol. 7(5) 407-415. Visser SA. Effect of humic substances on mitochondrial respiration and oxidative phosphorylation. Science Tot. Environment 1987 Apr; 62: 347-54. Klapper l, et al. Fulvic acid oxidation state detection using flourescence spectroscopy.Environmental Science Technology 2002 Jul; 15:36 (14) 3170-5. Kang SH, Choi W. Oxidative degradation of organic compounds using zero-valent iron in the presence of natural organic matter serving as an electron shuttle. Environmental Science Technology 2009 Feb 1; 43 (3):878-83. Rogoff MH, Wender I. The microbiology of coal Bacterial oxidation of phenanthrene Bureau of Mines, US Department of the Interior. Journal of Bacteriology 1957, 73(3):264-268. Klocking R, Helbig B. Medical aspects and applications of humic substances.Biopolymers for Medical and Pharmaceutical Applications. 2005. Mohomed I, El-Sayed K, et al. Anti-microbial, anti-oxidant and anti-ulcerogeniceffects of shilajit on gastric ulcer in rats. American Journal of Biochemistry and Biotechnology 2012 8 (1): 26-39. Jaiswal AK, Bhattacharya SK. Effects of shilajit on memory, anxiety and brain monoamines in rats. Indian Journal of Pharmacology 1992; 24:12-17. Ghosal S, Lal J. Effects of shilajit and its active constituents on Learning and Memory in rats. Phytotherapy Research 1993 7, 29-34. Pharmaceutical Chemistry Research Laboratory, Department of Pharmaceutics, Institute of Technology, Banaras University, Varanasi-221005, India. Mehdi A, Hasan G. Immune response of broiler chicks fed yeast derived mannan oligosaccarides and humate against new castle disease. World Applied Sciences Journal 2012 18(6): 779-785. Gutman Bass N, Catalano Sherman J. Humic acid intereference with virus recovery by electropositive microporous filters. Applied and Environmental Microbiology 1986 556-561. Joone GK, Dekker J, et al. Investigation of the Immunostimulatory Properties of Oxihumate. Zeitschrift fur Naturforschung Journal of Bioscience 2003 Vol. 58 (3/4), pp 263-267. Klocking R, et al. Antiviral properties of humic acids. Experientia, May 1972, Vol. 28, Issue 5, Pages 607-608. Sydow G, et al. The effects of phenolic polyments on retroviruses. Pharmazie,December 1986. Vol. 41, Issue 12, Pages 865-868. Klocking R, Helbig B. Interaction of humic acids and humic acid like polymers withherpes simplex virus type 1. Humic Substances in the Aquatic and Terrestrial Environment. Earth Sciences. Vol. 33, 1991; pages 407-412. Schneider J, Weis R, Manner C, Kary B, Werner A, Seubert B J, Reide U N, Inhibition of HIV-1 in cell culture by synthetic humate analogues derived from hydroquinone; mechanism of inhibition. Virology. 1996; Vol. 218; Issue 2; Pages 389-395. Goel R K, Banerjee RS, et al, Anti-ulcerogenic and Anti-inflammatory Studies With Shilajit, Journal of Ethnopharmacology April 1990 29(1): 95-103. Ghosal S, et al Mast Cell Protecting Effects of Shilajit and Its Constituents,”Phytotherapy Research. 3 (6): 249-252, 1989. Thiel K D, Heibig B, Kloching R; Vutzier P, Sprossig M, Schweizer H. Comparison of the in vitro activities of ammonium humate and of enzymically oxidized chlorogenic and caffeic acids against type 1 and type 2 human herpes virus. Pharmazie. 1981; Vol. 36; Issue 1; pp 50-53. R Junek, R.Morrow, JI Schoenherr, R Schubert. Bimodal effect of humic acids on the LPS-induced TNF-α release from differentiated U937 cells. May 2009 Phytomedicine Vol. 16 Issue 5 pp 470-6. Addington A, Alexander Schauss. Peat derived organic humifulvate concentrate: a new multi-mineral dietary supplement. American Institute for Biosocial and Medical Research.